Good Morning! 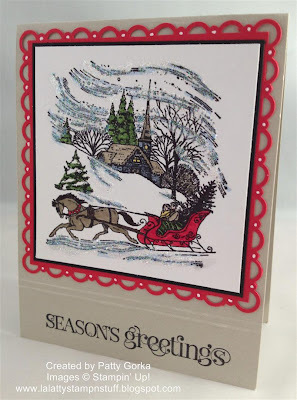 Today's 52 Christmas Card Throwdown is a theme challenge and this week's theme is a Christmas carol or hymn. I ended up making three cards for the challenge, what a fun challenge! I decided to use this cute 'let it snow' image and my song inspiration is 'Let it Snow' which is one of my favorite Christmas songs. Sleigh Bells is my very favorite song so I decided to go ahead and make a second card (posted below). 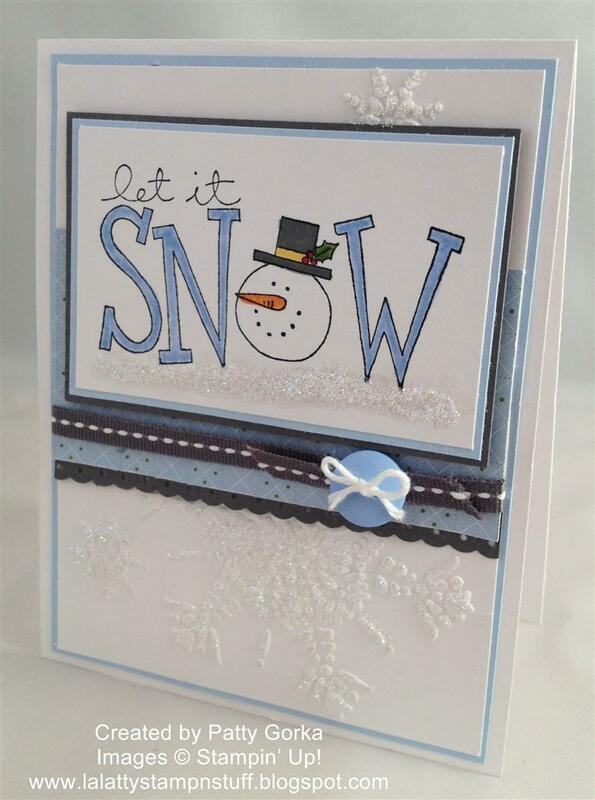 To make my 'let it snow' card I stamped my image and colored it using my SU markers. My background was dry embossed and then I lightly rubbed my versamark ink pad over the raised areas and I sprinkled some iridescent ice embossing powder and heat embossed it. It's hard to see in my photos, but it's really sparkly in person. I also added some more glitter under my let it snow image. I love glitter, can ya tell?!! For this card I used the song 'Sleigh Ride' for my inspiration. I simply colored the image using my SU markers and added lots of glitter. My red border was punched using a combination of my scallop trim border and corner punches. I started out with a 4x4 square, punched the corners first and then using the border punch I punched the scallops along the straight edges. I added some white dots along my real red layer using my white gel pen and just above my sentiment I added two dry embossed lines just to sort of break up the area of my stamped image and my sentiment. Basically my card is a mixture of white layers and dry embossed white layers. I love all white cards so this went together pretty quickly for me. 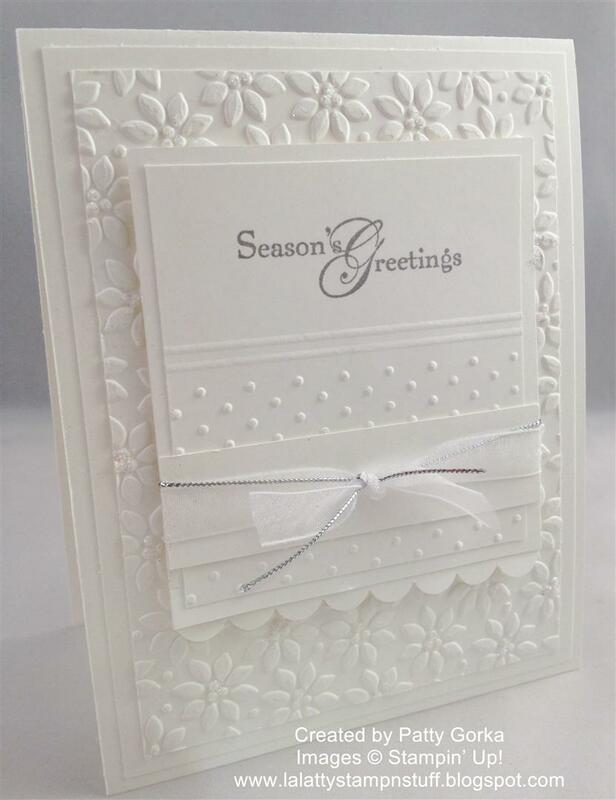 I used the petals-a-plenty and perfect polka dots embossing folders. Just below my sentiment I added two rows of dry embossing. Be sure to stop by the 52 Christmas Card Throwdown blog and check out the other DT member's cards! Patty these are georgeous! You always make the nicest cards and they aren't so complicated that I feel I can do them too - thank you for sharing! Wonderful Christmas cards, but I must say I just love that white on white, :), white on white always looks so elegant. Love the embossing. Wow! You are on a roll! I really like how you embossed the snowflake. But they are all georgeous! Beautiful!! Love the white on white card, but their all gorgeous. You must have a trusty stack of holiday cards now! Patty--these cards are great. I love the snow stamp--one of my favorites. And, the white on white is stunning! Way to go on your way to 100! Gorgeous cards. Love all the white and great BG's. Wowsers Patty, three terrific cards, I love them all! You chose great songs to depict in your cards too - I didn't mind singing along to all of yours LOL! I must ink my Let It Snow stamp up again - it always makes me smile! Nice set of cards. Great job coloring the Sleigh Ride card. The all white card is my favorite. I struggle with all white cards.